The childhood home which inspired Harry Potter author JK Rowling has gone on the market complete with trap door, cupboard under the stairs – and even a secret scrawl penned by the author as a teenager. Rowling, now 45, scribed her name into paintwork by her bedroom window alongside the words: ‘Joanne Rowling slept here circa 1982′ when she was 17. She lived in the Grade-II listed Church Cottage in the picturesque village of Tutshill – the name of a Quidditch team in the novels – with mum Anne, dad Peter and sister Diane from the age of nine to 18. 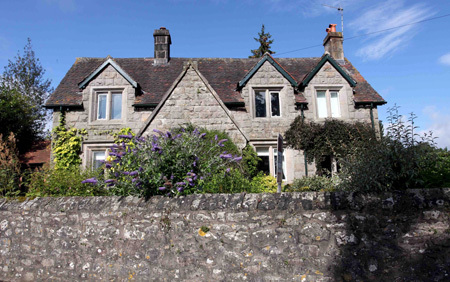 The detached stone cottage is thought to have provided much of the inspiration behind the multi-million selling Harry Potter series. Parallels include a dusty dingy cupboard under the stairs – where Harry is forced to live by his evil auntie Petunia and uncle Vernon Dursley in the books. There is also a trapdoor leading to an eerie cellar, which is seen when Harry searches for the Philosopher’s Stone in the first novel. The gothic architecture seen on the house is ”straight out of Hogwarts” and has a pretty cottage garden, including a herb patch like that seen in Professor Sprout’s Herbology lessons. Current owner Julian Mercer, a BBC producer, bought the three-bedroomed house near Chepstow, Gwent, from the Rowling family in 1995 and is now selling it for £399,950. He has preserved JK Rowling’s windowsill graffiti by painting around it whenever he has decorated the bedroom. 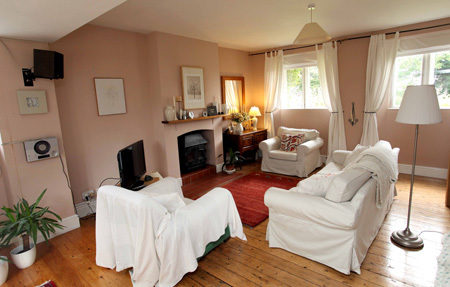 Mr Mercer said: ”It is a truly lovely cottage. It is quite small but has wonderful architecture and a gorgeous garden surrounding it. ”JK Rowling would have been here in her formative years and could have taken inspiration from the cottage. 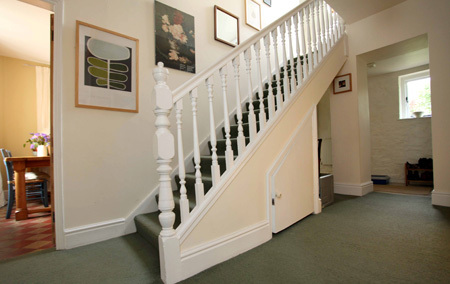 ”It has a cupboard under the stairs and the architecture is very Hogwarts-like. It has vaulted ceilings, stone windows and oozes gothic spirit. Rowling is believed to have lived in Church Cottage between 1974 and 1983. She moved out to study French and Classics at Exeter University before studying in Paris and moving to London to work for Amnesty International. Her parents continued living in the cottage until mother Anne died after a ten-year battle with multiple sclerosis and her father then began renting it out. The cottage has many features reflected in the book, with the most striking being the cupboard under the stairs. In Harry Potter and the Philosopher’s Stone, Rowling described Harry’s cupboard as small and dusty with lots of spiders – just like the one in Church Cottage. Harry lived in the cupboard at his aunt Petunia and uncle Vernon Dursley’s home at 4 Privet Drive in Little Whinging until he received his invitation to Hogwarts School of Witchcraft and Wizardry. His letter was addressed to Mr H Potter, The Cupboard under the Stairs. 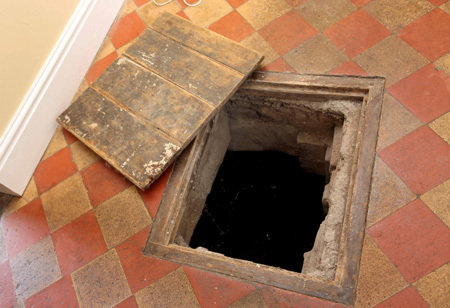 On the dining room floor of the cottage sits another familiar feature – a creaking trap door – which opens to a ”scary” small and damp cellar and old rain water reservoir. In the first Potter book, a three-headed dog called Fluffy guards a trap door leading to the Philosopher’s Stone. The passage from the door is described as being dark, damp and frightening. Outside the cottage are beautiful gardens, with lush green grass and a wide range of trees and herbs. Rowling even paid a special homage to the village of Tutshill by naming a top team in Quidditch – the game played on broomsticks in the novels – the Tutshill Tornadoes. Mr Mercer added: ”The cottage is in the small village of Tutshill, and the Tutshill Tornadoes are a Quidditch team that feature in the books a lot too. ”When we first moved in J.K Rowling was not a known name and it was a couple of years later that the Philosopher’s Stone came out. 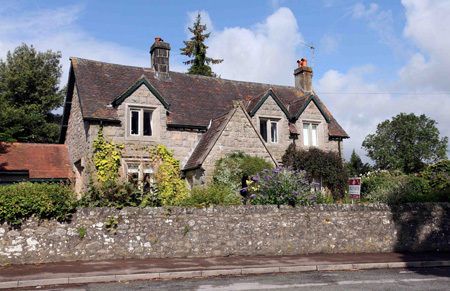 Church Cottage, built as a school house by Gothic Revivalist architect Henry Woodyer, is being sold by the estate agent Properts in Chepstow. A spokesman for JK Rowling declined to comment on the sale.